This post has been superceded/merged with a fresh post. The new collection is very exhaustive and contains 200+ hand sculptures till date. Click here to go the new post. 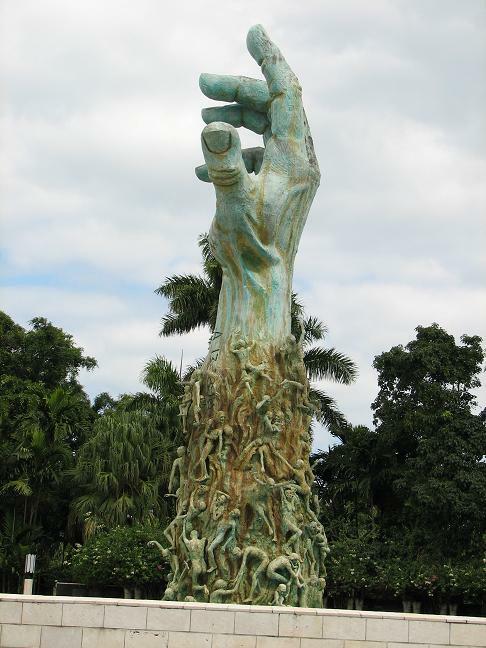 This is collection of Giant Hands around the World and contains, till now, following sculptures. (listed in random order). 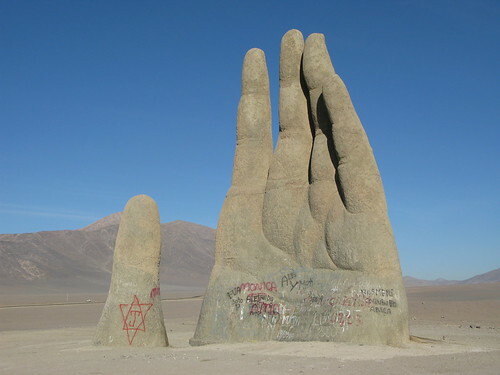 Hand of Desert, Atacama Desert, Chile. 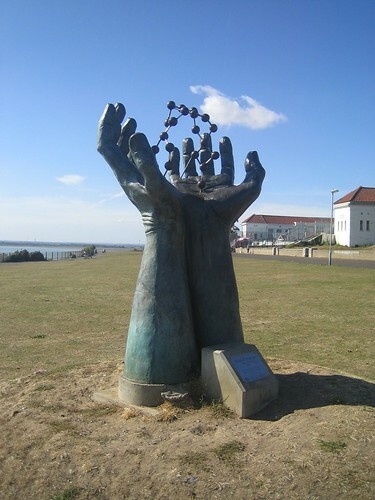 The Hand (aka Monument to the Drowned) Punta del Este, Uruguay. 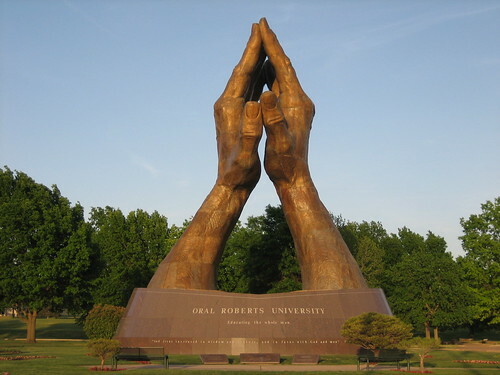 Praying Hands, Oral Roberts University, Tulsa, Oklahoma, USA. 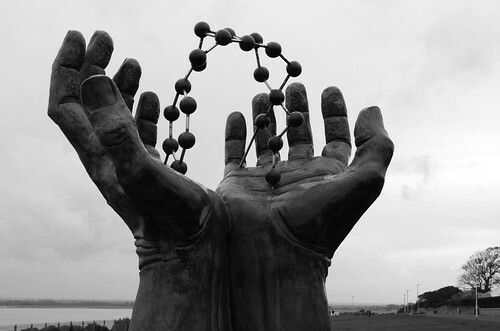 The Hand of Harmony, Cape Homi, South Korea. 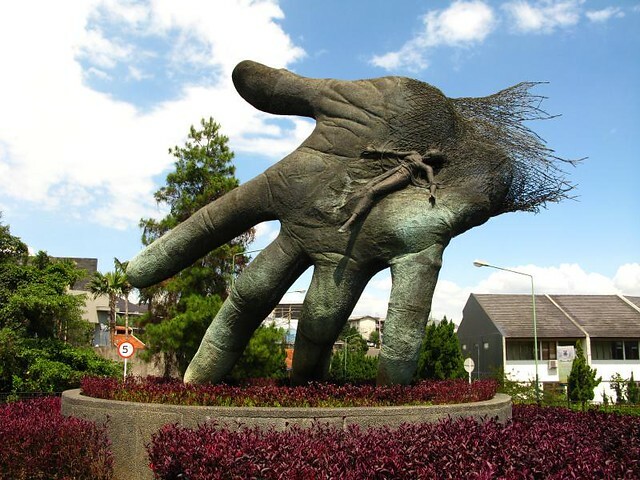 Giant Hand at NuArt Sculpture Park, Bandung, Indonesia. More hands will be gradually added in this collection. 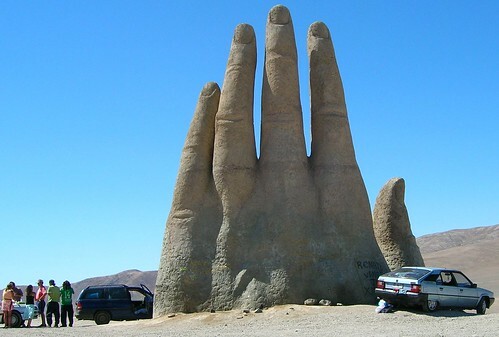 Mano del Desierto (meaning: Hand of Desert) is the third giant hand made by Mario Irarrázabal and is most famous of giant hands created by him. Inaugurated on March 28, 1992, the 11 metres (36 ft) tall sculpture, made of iron and concrete, is a must stop for the travellers on the desolate Atacama Desert stretch of Pan-American Highway. 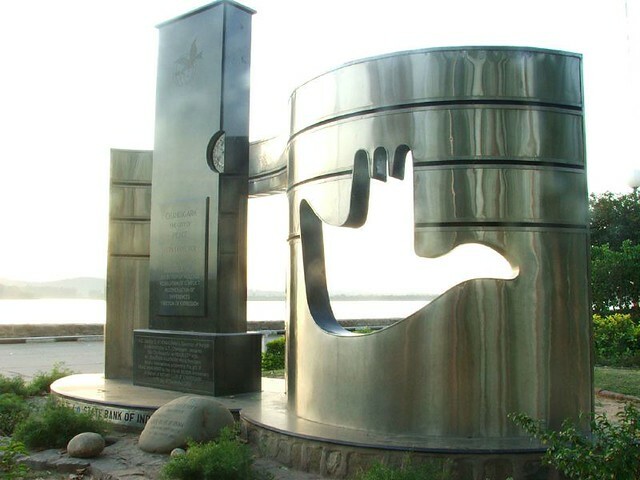 The Hand of Harmony is one of several sculptures on Homigot Beach, the eastern point of South Korea. 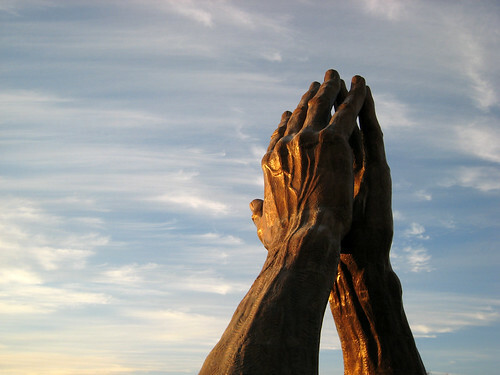 The rays of the rising sun are first to reach the hands signifying a new beginning for South Korea. The sculpture made from bronze and granite was built in 1999. 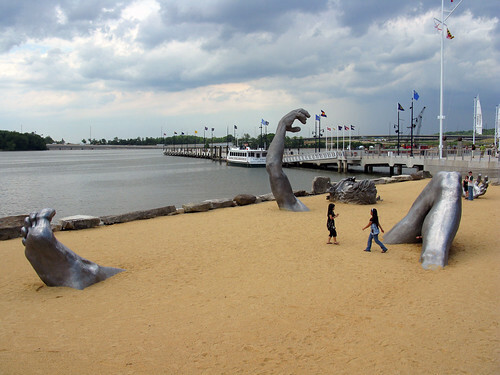 There is another hand at the nearby beach next to the light of millennium. 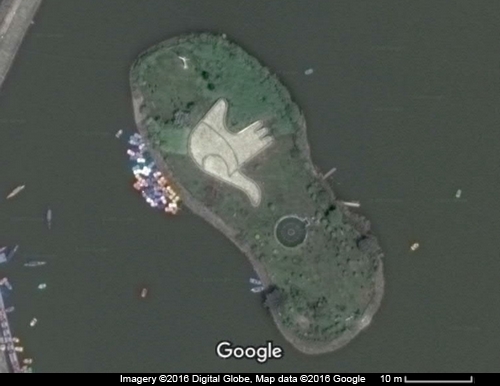 While the hand in the sea depicts a left hand the second on the beach shows a right hand. Credits: I am thankful to jeito for informing about the second hand (shown above) and allowing me to use his images. Thank you jeito. 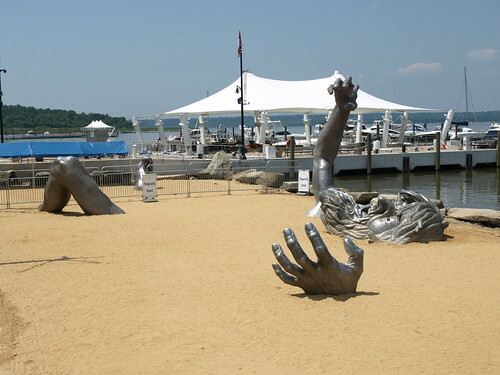 "The statue consists of five separate aluminum pieces buried in the ground, giving the impression of a panicked giant trying to pull himself to the surface. The left hand and right foot barely protrude, while the bent left leg and knee jut into the air. 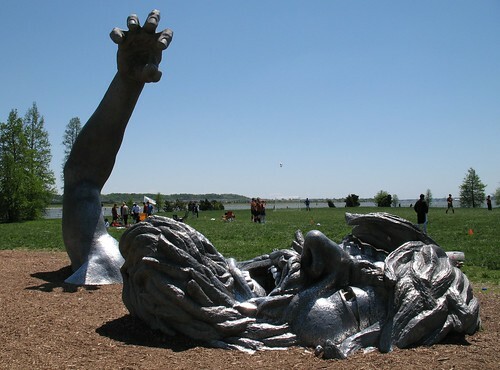 The 17-foot right arm and hand reach farther out of the ground, and the bearded face, with the mouth in mid-scream, struggles to emerge from the surrounding earth." 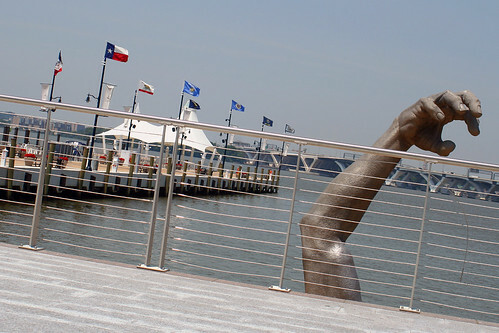 Because of its huge hand, which is distinctly separate from giant's body, the sculpture has been included in this "Giant Arms Around The World" collection. 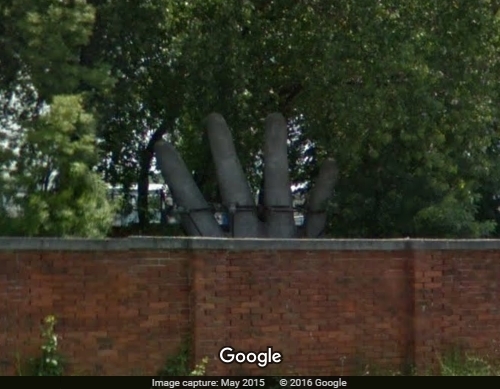 A pair of giant hands located in a park near the Calabar Museum, Duke Town, Nigeria. No information is available about these hands however the Panoramio image (shown below) has referred to these as "Hands of God". 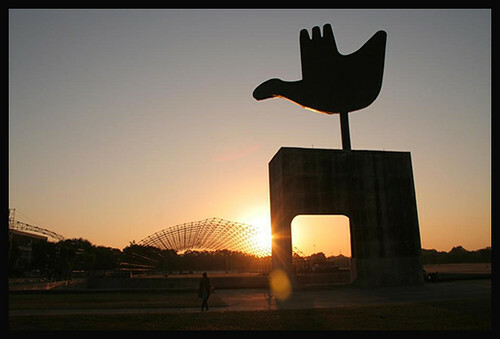 This sculpture made in 1987 was the second giant hand made by Mario Irarrázabal. 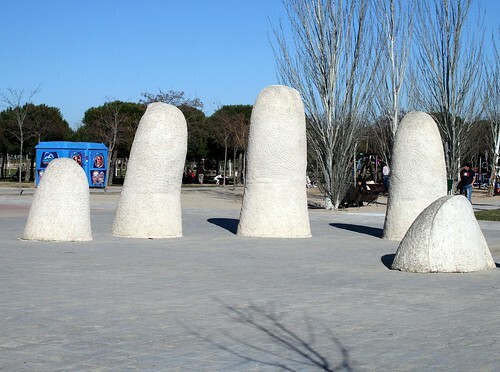 It is similar to his original sculpture in Punta del Este, Uruguay and shows five fingers partially submerged in the ground. 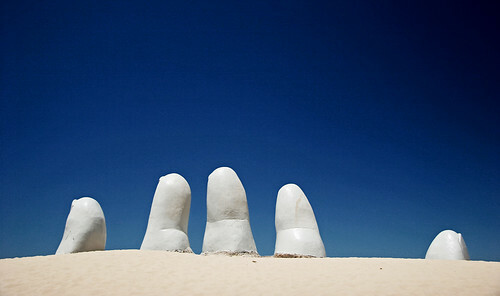 However unlike the original hand at the Brava Beach, Uruguay, where the fingers rise out from the sand on the beach, the fingers here are rise out from paved ground. 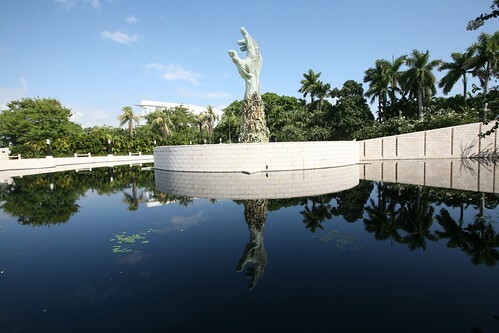 Thanks David for the link to the giant hand at Holocaust Memorial in Miami. I will add it now in the blog post. During my Google searches for Giant hands it didn't appear in the results, hence it was not included.